NEW DELHI | BENGALURU: The demand for office space among corporates is rising but what is holding back leasing activity is shortage of good quality office space in top cities. While many new office projects have kicked off in the last few months to augment supply, a few builders are trying to capture demand early by speeding up construction using pre-fabrication technology which allows them to finish a building in 12-15 months as opposed to around 20-24 months using traditional methods. Using this technology, parts of the building like the walls are built in a factory nearby and then transported to the site and assembled to finish the building. In Gurugram, private equity fund and developer IREO is building an 11 million sq ft IT SEZ on 67 acres of land in Gurugram’s Golf Course Extension Road using this technology. In the first phase, it has started construction of a 1.2 million sq ft building that it says will be completed in just 1215 months, allowing the company to tap in to the demand for quality space that exists today among top corporates. Builder Embassy is working on a 1.5 million sq ft building in its Embassy Tech Village on the Outer Ring Road in Bengaluru that will be completed in 13.5 months, says Mike Holland, CEO, Embassy Office Parks. Another Bengaluru-based builder Salarpuria Sattva is exploring using this technology to building the remainder of its 6.5 million sq ft commercial complex in Hyderabad.The company has already built 2 million sq ft using traditional construction methods and plans to use pre-fabricated structures for the rest 4 million sq ft, says Bijay Agarwal, managing director of Salarpuria Sattva Group. “We want to cut down on construction time which will help us rotate the space quickly,” he says. This speed, of course, comes at a cost. Using this technology is 5-10% more expensive, say builders. “Yes it is more expensive than regular construction, but then you save almost 6-12 months of construction time which would eventually translate into savings for us and bring in rentals early,” says Ramesh Sanka, chief executive officer of IREO. To finish the building in 12-15 months, IREO is setting up a pre-cast plant near the construction site to manufacture pre-casted walls that will have insulation sandwiched between two layers to provide permanent protection. In 2015, India’s top seven cities saw a record 38 million sq ft of office space being leased, 18% higher than 2014, according to property advisory firm CBRE. The first six months of calendar year 2016 have seen over 17 million sq ft being leased. Property consultants, however, say that leasing is now taking time because most key micro-markets do not have enough new supply to handle the current demand. He points out that in the top markets, there is nothing available that is ready to move in for corporate clients and whatever is under construction has already been pre-leased. 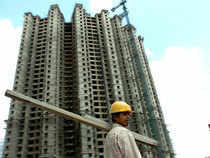 Chandnani says some builders are using the technology for built to suit buildings be ing made for corporates. Since it started construction two months ago, Embassy has already completed two basement floors of 206,800 sq ft, compared to the average six months that traditional construction methods would require, says Holland. The company has leased 50% of the space in the property to aerospace firm Quest and is discussing with a few clients to lease another 400,000 sq ft of space.